The AGORA Team wishes to inform you that, on 25 October 2018, the Subject Categories were expanded (from 14 to 46!) to journals indexed in AGORA content portal/search database! Access to Global Online Research in Agriculture (AGORA) is one of the five programmes composing Research4Life. 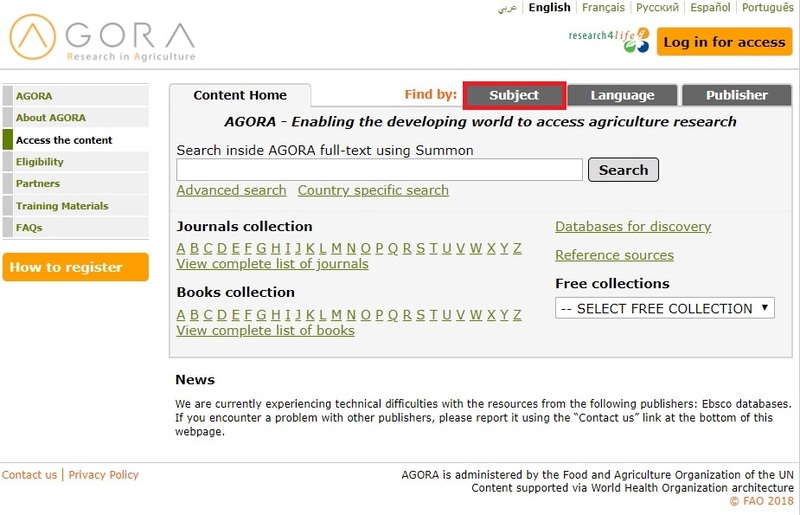 Currently, AGORA provides free or low cost access to 13,748 peer-reviewed journals and 26,686 e- books (in agriculture and related sciences) to more than 3,400 institutions from more than 115 eligible countries*! The effort to extend the number of AGORA Subject categories aims to make it much easier for AGORA users to find material relevant to their area of study. New AGORA subjects will be identified by permanent IDs and match with the related concepts/terms populating FAO-AGROVOC multilingual thesaurus*. The AGORA Team will keep working to identify and map all available journals under subject categories and will inform you once the new subject categories are successfully implemented! Please note that e-books indexed in AGORA will not initially have any subject categories; these will be added in batches, over time, during Phase II of the migration process. You will be informed when this phase begins. to access/use the content of AGORA, HINARI, ARDI, OARE and GOALI programmes. Be careful selecting the CORRECT COUNTRY, AREA/TERRITORY NAME. If it is not listed, it is not eligible.